Looking for a great gift to make for the Holidays? I've got the perfect solution - a set of monogram cards! From one piece of 12" x 12" Designer Paper, a few pieces of card stock and your JustRite Damask Borders Monogram Stamper Kit, you can make up some beautiful gifts in no time! Simply take your 12" x 12" piece of card stock and cut it into 2 strips of 5" x 12", cut those strips to 3-3/4" x 5". You should now have 6 pieces that measure 3-3/4" x 5". With the left over DSP, I made strips to adhere to my cards under my monogramming. These DSP strips measure 5" x 3/4", and are layered on a piece of coordinating card stock that measures 5" x 1-1/4", then layered on my DSP panels. I layered these panels on Artichoke card stock, then my Vanilla base card. 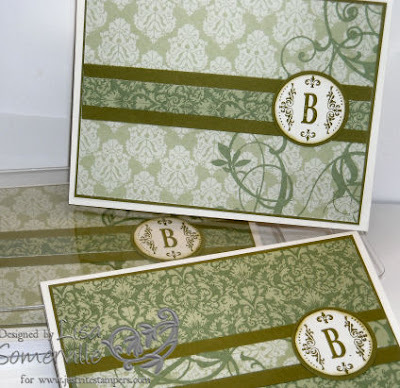 My Damask Borders Monograms are stamped in Artichoke ink on vanilla card stock, and cut with my nesties, then layered on Artichoke card stock, that I also cut with my nesties, then layered on my base card. From now through November 30th - when you purchase one Damask Borders Monogram Stamper Kit you can get one FREE over at JustRite! Click here to see all the other wonderful JustRite Products on the Buy One Get One FREE Sale - but hurry this sale ends November 30th! Beautiful gift and idea thanks Lisa for the how to's also.